CAR NEWS GRAB BAG… by Jim Corbran, Automotive Columnist Wasting time on the web the other day (c’mon, you’ve done it) I came across a full-size Little Tikes Crazy Coupe for sale on eBay in the UK, custom-built in 2013 by a firm called Attitude Autos in Oxfordshire, England. It started life as a Daewoo Matiz (a.k.a. Chevy Spark) and is a fully legal (well, at least in the UK) road car. You can check out the eBay listing here. Also, Attitude Auto’s website can be accessed here… If you’re of a certain age, like I am, you probably grew up with a collection of Matchbox cars. At first they were kept in one of Dad’s old cigar boxes, but eventually they wouldn’t all fit in there, so other means were found. (I still have a gazillion of them.) While wasting time on the internet the other day (see above, Lol), I came across this YouTube video which a Facebook friend sent me. It shows the Lesney (Matchbox) assembly plant back in 1962. Wow, how interesting! I only know that if I had worked there I would have had to wear pants with extra large pockets, if you know what I mean. See the video here… As long as you’re on the internet, and if you are a member of Facebook, head over to the Odd Vehicle Society page and check out some of the strange contraptions there. 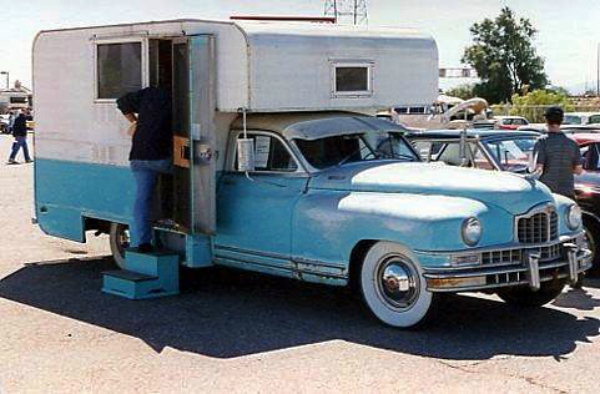 This late 1940s Packard camper conversion is one of the tamer ones. Just the other day I also saw a motorcycle with an old cut-up Citroën 2CV as a sidecar; a prototype of a 1941 Ford with a soybean-based body; and Cary Grant posing with an old BMW Isetta microcar. Surf’s up! ### The post CAR NEWS GRAB BAG… appeared first on Buffalo Cars.